Under perfect weather conditions, a professionally built roof made from superior materials can outlive many of us. Unfortunately, those of us living in the Phoenix metro area realize the fact that we don’t experience perfect weather. Triple digit temperatures, direct exposure to sunlight, blowing winds, and monsoon rains can cause havoc to any tile, shingle, or flat roof. 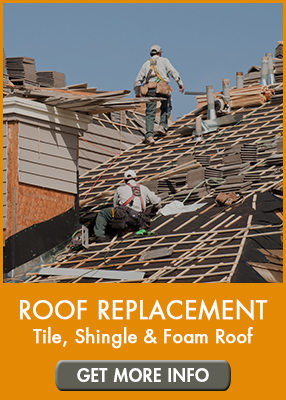 While some damage can be repaired, eventually, full roof replacement will be required. This is where the roof installation experts in Phoenix, AZ Roofing Works has the proven skills and experience to complete any residential or light commercial roofing replacement service you need. Tile roofing is the most popular type of material used in the Phoenix Valley. This type of roof has the longest life expectancy, holds up exceptionally well against the harsh weather conditions, and is visually appealing. There are multiple material types of tiles that can be used during roof construction including concrete, clay, metal, composite, or Spanish style. Materials can be mixed and matched to suit your individual taste or HOA compliance. Asphalt Shingle Roofing: This type of shingle roof is available in two forms; fiberglass and organic. Organic roofing shingles are a combination of clay particles, adhesive asphalt and paper. This type of shingle is water resistant, which makes them great for those monsoon summer storms and preventing roof leaks. The other material is fiberglass which is comprised of wet fiberglass and resin and is resistant to fire. Polymer Shingle Roofing: Made from a proprietary chemical blend, the polymer shingle roof is an excellent material for hot summer weather. They are water resistant and can protect a home from fire, excessive heat, and rain. Foam Roofing: The primary material used in foam roofing projects is polyurethane. However, foam roof materials also include silicone, acrylic, polyurea, and other urethanes. It’s a durable roofing material that is exceptional for insulating a home. BUR: The Built-Up Roof (BUR) is a very popular and quite affordable roofing system. It’s built-up using hot tar and layers of water-resistant materials applied to essentially make a flat roof sandwich. Once the layers have been applied, a pebble-like substance is applied for texture and added protection. PVC Roofing: Polyvinyl Chloride is a plastic material used to build flat roofs. It has multiple layers of thickness but is often completed on a custom-built basis. Modified Bitumen: This type of material is an energy-efficient type of flat roof. This surface is often designed in light colors which helps to reflect solar heat. Whether you live near ASU, off the 101 or I-10 – our team of passionate and experienced professional roofers will cater to your needs. Our dedication to craftsmanship, getting the job done right – the first time, and our dedication to open and clear communication are trademarks of AZ Roofing Works. We offer Experience You Can Trust – and we offer FREE estimates all the way to full roof replacements and everything in between. 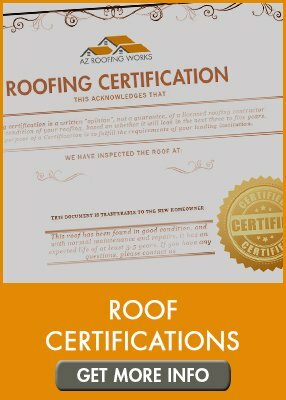 AZ Roofing Works is a Licensed, Bonded & Insured Roofing Company located in Mesa, Arizona. 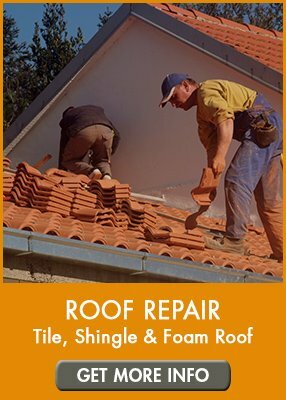 We are the preferred Residential & Light Commercial Tile, Shingle, Foam & Flat Roof Repair and Roof Replacement company serving the Greater Phoenix Arizona area. 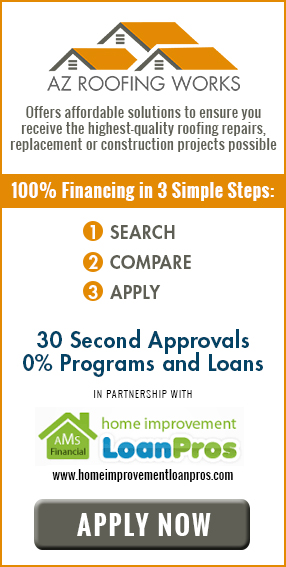 Why AZ Roofing Works? Because our expert roof team has Experience You Can Trust! If you are in need of roof inspection, roof maintenance or roof repair service in Mesa, Chandler, Scottsdale or any other Metro Phoenix location, AZ Roofing Works is ready to help you! Contact us today, either online or call our office directly at (602) 283-3383.